Containers are seen at the Busan Port in Busan, South Korea. China’s domestic demand has increasingly become more important for Asian trade. Investors are, once again, worrying about sharply lower Chinese growth and its impact on the rest of Asia-Pacific. The late 2018 weakness has likely spilled over into this year and has nudged our forecasts lower for some of the open economies. 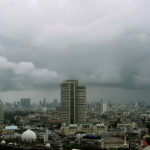 However, fears of the ongoing slowdown turning into a slump appear overdone. 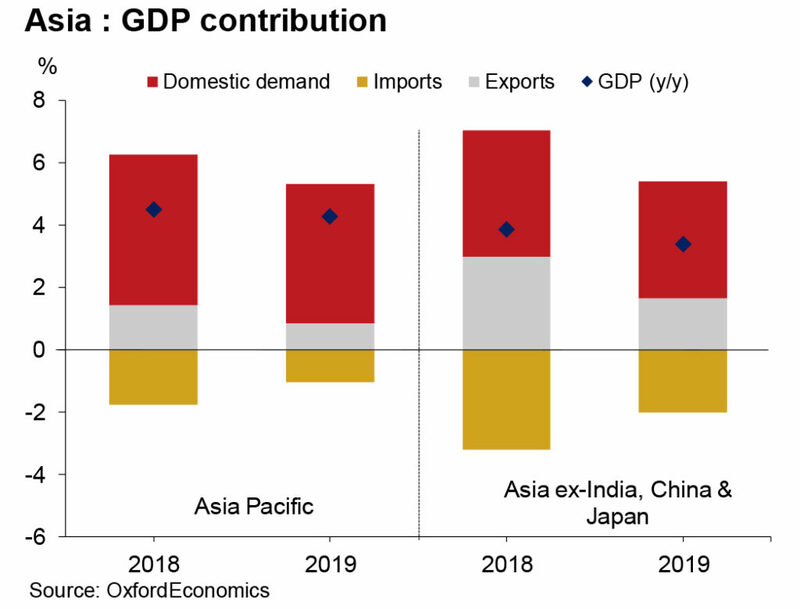 We expect the downside pressures on Asia-Pacific growth to ease heading into H2 as the Chinese economy finds a floor and accommodative macro policies support domestic demand. The year has undeniably started on a soft note, in and outside of Asia-Pacific. Bottom-up data indicate that the late 2018 weakness in global economic activity has spilled over into 2019. And with China slowing to below trend, the rest of Asia-Pacific has expectedly not fared well. 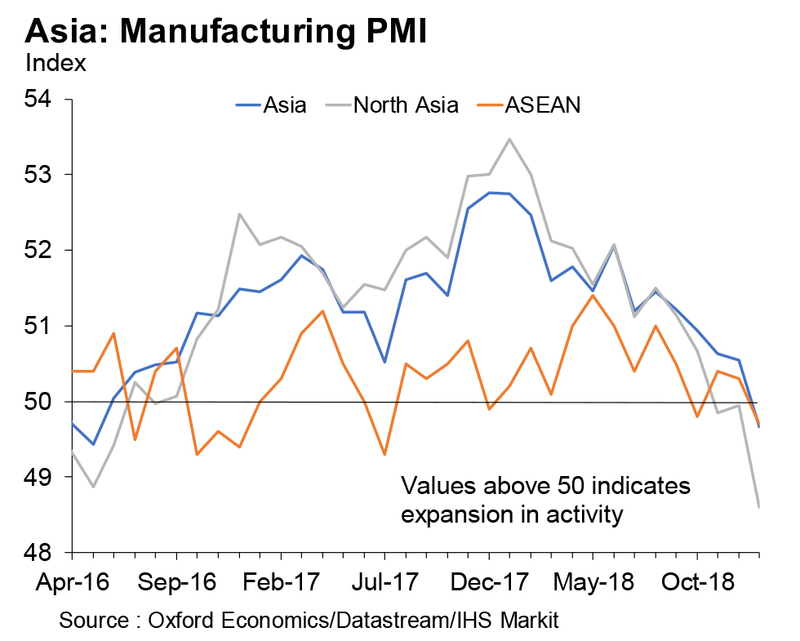 In January, our aggregate measure of the Asia PMI slipped into contractionary territory (below the no-change-in-activity level of 50) for the first time since May 2016, extending the broad-based loss in momentum that had been visible through most of 2018. Indeed, India is the only major Asian economy where the widely followed survey has continued to point toward strong expansion in activity in recent months, although this is not corroborated by the country’s industrial production data. 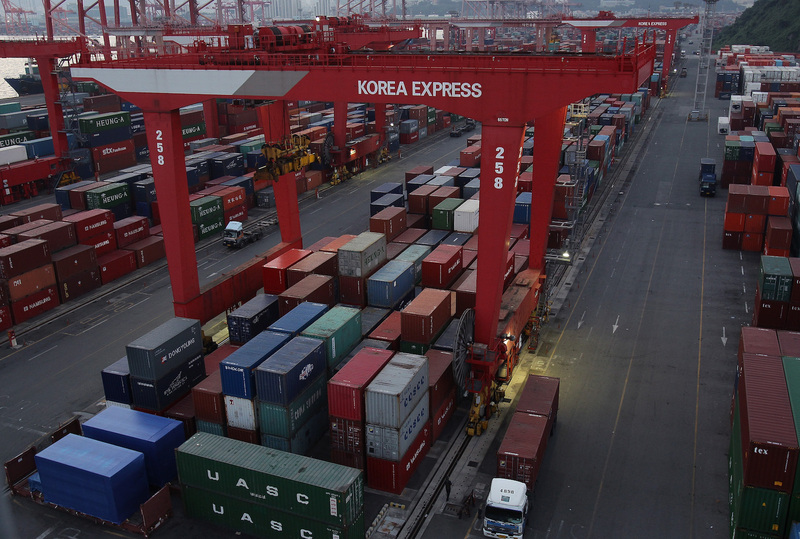 South Korea’s trade data, which is considered a leading indicator of the region’s exports trends to some degree, paints a similarly worrying picture. Its nominal (USD) goods exports have declined for two consecutive months now. Officially, January’s fall was attributed to falling export prices. But we find that real export momentum has weakened since Q4 2018, and shipments to China also remain soft. Clearly, despite the positive developments between the U.S. and China on the trade front, weakening domestic demand in China and, to a lesser extent, elsewhere has taken its toll on the region. 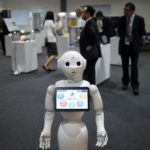 Reflecting this, we have revised and lowered our growth projections for some of the open economies and now forecast Asia-Pacific growth to slow to 4.3 percent in 2019 (versus 4.4 percent earlier) from 4.5 percent in 2018. At first sight, this may appear to be a modest adjustment in comparison to the downshift in global trade growth witnessed in recent months. In part, this is because we have not been completely blindsided by the data. We have highlighted on several occasions previously that China’s domestic demand has increasingly become more important for Asian trade, and our below consensus forecasts have incorporated the negative impact of a Chinese slowdown on the rest of the region for a while now. In addition, we foresee reasons for growth to stabilize going forward. While the more open economies may come under further pressure in the near term, we think that fears of the slowdown turning into a slump are exaggerated. To begin with, the sequential bounce-back in China’s imports in January tempers concerns of a sharp decline in its domestic demand. Our view remains that a move to a more expansionary policy stance by Chinese authorities and efforts to improve the “policy transmission mechanism” will provide a floor to the mainland’s growth by the middle of 2019, in turn supporting the rest of the region. Furthermore, we continue to expect domestic demand to cushion the region from trade headwinds, aided by accommodative macro policies. We are mindful that exports have important spillover effects on investment and consumption, especially in the more open economies. 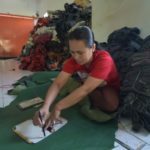 This is primarily because manufacturing, which is the dominant sector in these places, is largely export-oriented. Hence, lower exports can percolate into slower production and investment, weak labor markets, falling wages and lower consumer spending. 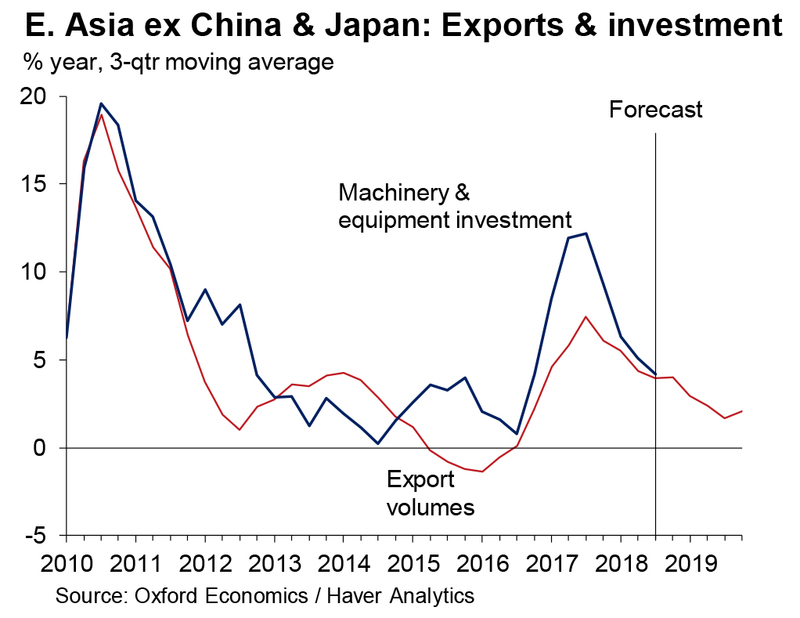 Private capex, especially in machinery and equipment (M&E) investment, has been on a downtrend in some of the places where export growth has notably decelerated—such as Taiwan, South Korea, Singapore and Malaysia—raising concerns of a repeat of 2015/16. However, we do not expect the external environment to turn as worrisome this time. Our forecast for Chinese import growth for 2019 is still notably stronger than in 2015/16, and global trade growth is expected to be stronger in 2019 than in 2012-16. Also, partly offsetting the slowdown in M&E investment are encouraging trends in investment in the non-tradable sectors, such as construction, especially in emerging Asia. This is largely due to the infrastructure push from governments, even as residential investment is held back by housing-bubble worries in many economies. 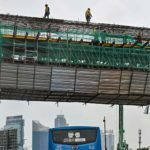 On average, civil engineering (roads, railways, power, water, air and others) work accounts for 50 percent of total construction in emerging Asia, and we anticipate notable spending growth in this category in 2019. This is expected to keep total construction investment growth at broadly similar levels to last year and limit the downside to overall investment. Meanwhile, consumption growth appears buoyant across the region, if moderating from the 2018 highs. Benign inflation conditions and rising real income growth continue to support household spending, and the outlook is bolstered by solid labor market conditions. With unemployment rates near decade lows in most Asian economies, we expect Asia ex-Japan’s real income to grow just under 6.5 percent in 2019 compared to an average pace of 6.2 percent over the last five years. Fiscal policies are likely to be supportive of growth elsewhere in the region as well. This is particularly true for Northeast Asia—Hong Kong, Taiwan and China, in addition to South Korea. But we also expect government spending to be strong in India, Indonesia and Thailand ahead of upcoming elections in the first half of 2019, despite the limited fiscal space in these economies. 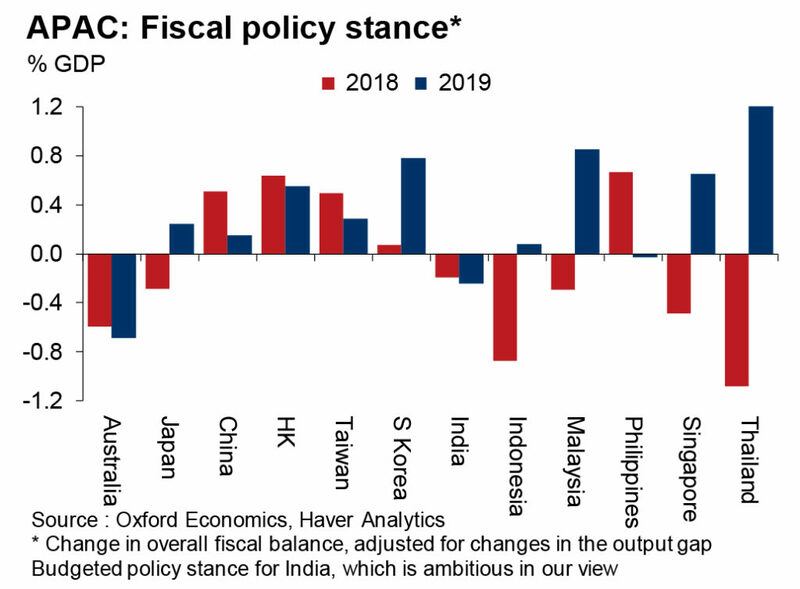 In fact, we think that many governments in the region, including Indonesia and Malaysia, may miss their ambitious fiscal consolidation targets for 2019, while India may err on the side of fiscal profligacy for the third consecutive year. Further bolstering the outlook for domestic demand is the shift in our monetary policy expectations. The recent change in the Fed’s rhetoric and lower external financing—due to oil prices declining and currencies stabilizing—have meaningfully eased the pressure on Asian central banks to tighten monetary policy aggressively. Though the possibility of widespread rate cuts remains low given the region’s debt overhang, we expect central banks to turn more patient and keep policy rates unchanged well into the second half of 2019, amid muted inflationary pressures. This should largely ease monetary conditions in the coming months and stimulate growth, alongside expansionary fiscal conditions. Priyanka Kishore is the head of India and Southeast Asia economics at Oxford Economics. 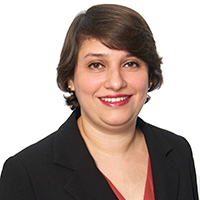 She has more than a decade of experience in macroeconomic research and forecasting across emerging markets, with a special focus on India and ASEAN. 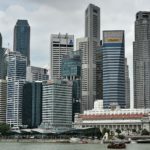 She currently leads Oxford Economics’ Singapore Global Macro Services team and is responsible for overseeing the firm’s South and South East Asia research. How will the U.S. Presidential Election Impact Asian Economies?